Refer to “exterior parts removal and installation” in section 9d . 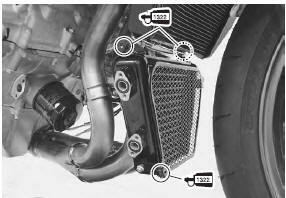 Inspect the oil cooler hoses for any damage and oil leakage. If any defects are found, replace the oil cooler hose with a new one. Remove the oil cooler guard (1). 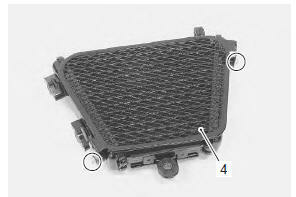 Inspect the oil cooler for oil leakage. If any defects are found, replace the oil cooler with a new one. If the fins are bent or dented, repair them by carefully straightening them with the blade of a small screwdriver. Remove the oil cooler mounting bolts. Blow out any foreign matter that is stuck in the oil cooler fins using compressed air. make sure not to bend the fins when using compressed air. If compressed air is applied from the front side, dirt will be forced into the pores of oil cooler. Remove the oil cooler guard (4). 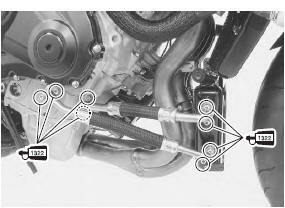 apply thread lock to the oil cooler mounting bolt and tighten them securely. Apply engine oil to new o-rings. replace the o-rings with new ones to prevent oil leakage. Pour engine oil. Refer to “engine oil and filter replacement” in section 0b .